For lens in 52mm, 58mm and 67mm (adapters included). NOTE: PLEASE VERIFY YOUR CAMERA’S LENS THREAD SIZE BEFORE ORDERING. This kit is compatible with 52MM, 58MM and 67MM lenses. Lens sizes vary regardless of camera brand or model. Your camera’s lens thread size will be marked somewhere on the lens barrel or printed underneath your lens cap. This number is always preceded by a “Ø” (diameter) symbol. For example: Ø58 = 58mm lens thread size. It fits on top of your existing lens, not directly onto the body. You do not lose any of your camera’s functions! Compatible with all lenses with filter diameters of 52mm, 58mm and 67mm using the conversion rings provided. In many situations an ultra wide angle lens can be highly creative – for example in landscape photography in which the addition of a foreground object renders the full depth of the scene. The 0.4x coefficient constitutes a good compromise. For example, a 0.15X converter will give a Fisheye effect (circular photo), whereas a 0.5x converter will give a moderate wide angle. The 0.4x converter provides a Fisheye effect which is not too marked, thus avoiding excessive deformations. This coefficient also provides remarkable optical qualities. The “plus point” of this lens is its ability to take close-up macro views of around one millimetre. Simply detach the macro attachment and screw it on the end of your lens. Ideal for numismatics. This converter is 100% compatible with your camera, maintaining image stabilisation and all automatic systems. 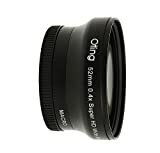 This lens can be used with a zoom or a fixed focal length. With a zoom you will be able to vary the focal length and obtain a more or less accentuated Fisheye effect. All the optical surfaces have multi-layer treatment. The brushed black finish is also of high quality. The lens body is made of metal (titanium), combining lightness and strength. How do you use this lens? Simply screw it on the end of all photo and video lenses with a filter diameter of 52mm, 58mm and 67mm using the conversion rings provided. Be careful to check the filter diameter of your lens. The filter diameter of your lens is marked near the front lens, and always preceded by the symbol “Ø”, e.g. Ø52 = 52mm. It is also marked on the back of your lens cap. Specifications:- 4 elements in 4 groups with multi-layer treatment- Mounts: 52mm, 58mm and 67mm. Supplied with protective case, covers and conversion rings.10-year guarantee + 30-day money back guarantee. This entry was posted in Discount Photography and tagged Angle, D100, D200, D300, D3000, D300S, D3100, D3200, D3300, D5000, D5100, D5200, D5300, D600, D610, D700, D7000, D710, D7100, D7200, D800, D810, lens, Macro, Nikon, Ultra, Wide by Ball Photo. Bookmark the permalink.